Happy hour just got a lot more exciting with this pepperoni pizza made in the air fryer! 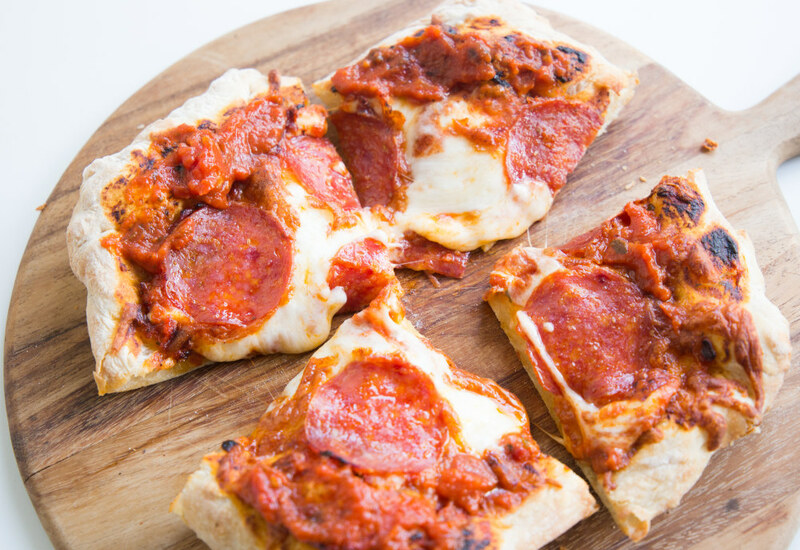 All you need is dough, sauce, mozzarella cheese, pepperoni, and an air fryer and you will have a perfectly cooked pizza in 20 minutes. Just put your pizza together in the air fryer basket and cook for 10 minutes! Make this for happy hour, game day, Friday night pizza, or really any time of the day. Serve with a nice green salad and your favorite refreshing beverage for a complete meal. Add roasted garlic to this pizza! It adds a nice richness and texture to your bite. Try other combinations of flavors, depending on your mood. Pesto with artichoke hearts and chicken is always a good one. The traditional Hawaiian-style with Canadian bacon and pineapple is a crowd-pleaser. Or just keep it simple with sauce and cheese! Per Serving: 623 calories; 13g fat; 103.3g carbohydrates; 20g protein; 20mg cholesterol; 763mg sodium. By happy coincidence and thanks to Trader Joe's I happened to have all of these ingredients on-hand. Turned out so nicely! I'm loving the Mealthy recipes for air fryer!